When I was a young bronc oh so many years ago, I remember camping at the Fort Davis State Park with a friend and his parents. I probably wasn’t more than about 10 or 12 so this would have been in the early to mid 1970s. On our way home we headed northwest toward Kent, TX. We stopped at a road side park to eat lunch somewhere between Fort Davis and Kent. If I remember correctly it was set back from the road maybe 100 yards. You could still see an occasional car pass by on the highway. What made it such a memory was that it was a giant boulder pile in the middle of a prairie. It was odd because the nearest mountain or escarpment seemed several miles away. We spent a good couple of hours “spelunking” in, under and around those giant rocks having a blast. I never knew if it was private land and the owner didn’t want the liability of someone getting hurt on their property, or if it was state land now closed to the public. Either way access is probably still not available, but does anyone remember this place or know anything about it? I was there about a year ago. We were able to get in with owner's permission. Fun spot, but yep it's closed. It's right across from the Sawtooths. And, yes, Kit Carson is still there. Thanks guys. I just knew someone else had to have known about this place. 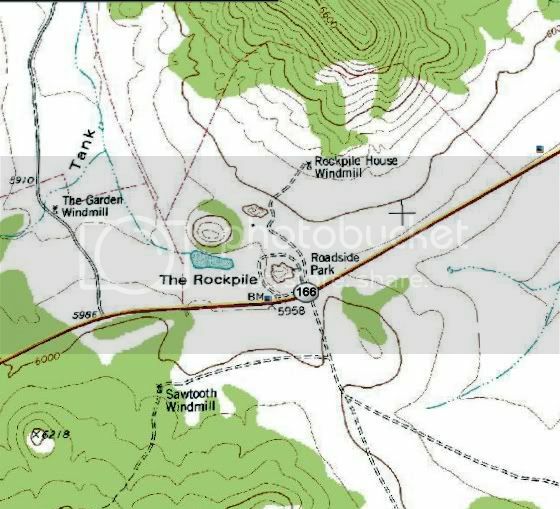 I did find it in Google Earth and it is even labeled “The Rockpile” Roadside Park on the topo map. Glad to hear access might be possible with permission. If anyone is interested, it appears to be for sale. 55,374 acres at $985 per acre for a total price of $54,516,795.00 cash. Awesome! It has really awesome house and barn that come with it. In the early 70's, on one of our family vacations to West Texas, we stopped at the Rockpile for an afternoon of exploration while driving the scenic loop and visting McDonald observatory. Dad showed us the Kit Carson spot, and the incredible numerous rock art and paintings that had been left by early antive Americans. In many many places the more recent modern graffitti had damaged a lot of the native rock art, which was why I heard that years later the state and private owers had decided to limit access to the site. I remember at one spot there was a a very large, still colorful drawing that looked like a large indian blanket with huge stripes of color. My little brother and myself spent hours climbing the boulders, and at one point, while were atop one tall pile of rocks about 25 yards away we looked over to see a mountian lion sitting on another pile of rocks staring at us. It got up as my brother and i watched, slack jawed in amazement, as it slowly stretched, turned, and walked away. When we breathelessly reported to mom, she put an end to our explorations. I would love to take my son and daughter to explore this great spot, its a damn shame that idiots who vandelized the rock art have ruined it for everybody else. Somewhere I have pictures of that spot I took last year. I never did anything with them, but I guess I'll have to sort through my billions of bits and find them! Does anyone know what Carson was doing in the area? Hunting Indians? And if I had $55mil, I'd jump ALL over that ranch!!! He was a teamster on the Santa Fe Trail during that time.